The following is an excerpt on DOE designed experiments techniques from Six Sigma Demystified (2011, McGraw-Hill) by Paul Keller. 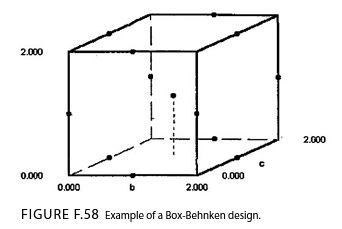 Box-Behnken Design - (BBD) A Box-Behnken design (named for the authors who proposed it) uses a selection of corner, face and central points to span an experimental space with fewer points than a Complete Factorial Design. It is similar in intent to a Central Composite Design, but differs in that no corner or extreme points are used. It has no extended axial points, so it uses only three-level factors. BBD usually require fewer runs than a three-level fractional factorial design, and they are useful to avoid the extreme factor level combinations that central composite designs might require. An example is shown below. Notice that instead of corner points, factors are run at midpoints and the center on the cube. An example of a Box-Behnken design.